So research represents only 1.19% of the overall GDP (and decreasing!) while the average in the EU is above 2%. 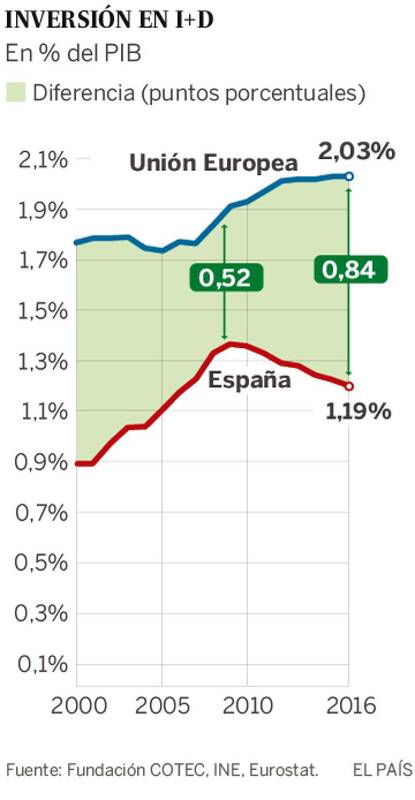 You may think that this can be explained because Spain is drowned in a horrible economic crisis; but, while this was maybe true in 2008-2010, in more recent years Spain main industry, tourism, is growing wildly and beating records. Other sectors of the economy are not doing bad either. Research has never been a priority for any Government of Spain. I guess it is treated as wasted money when they prepare the budget they agree to keep it at a minimum while still covering some sort of EU quota . But in these last few years, I think that research is being treat worse that ever and, if this prolongs, research made at Spanish universities (the “traditional” poles for research in Spain) will simply collapse. This is a rather catastrophic situation that may plunge Spanish universities even lower than they already are and only some research-only centers seem to be holding a little bit better. In the last 3-4 years I have been trying to do (mostly) research in University of Barcelona with a decent, at least given the funding conditions, output. All the research I have done in the last 1.5 years has been basically for free and rather independently, i.e. I have not get any economic reward for doing it and I was not expected to do any research since I only have a part time teaching contract (I am “professor associat”, i.e. assistant professor). Nowadays, It seems that Spanish universities have dropped one of the two roles it had (teaching and research) to keep only the teaching part. I guess this happens because there is still enough amount of young people who want to study. Teaching has become the only type of work you should do at the university: the scarce new university positions are assigned to departments based only on teaching criteria and permanent staff (which in general is very aged) is totally discouraged from doing any research since they get basically the same amount of money at the end of month whatever they do. So the most part of them have chosen (I guess wisely) to abandon (if they ever did) any real research activity. Moreover, the quality of teaching is not controlled in any way, and the ridiculous salaries associated the non-permanent teaching positions that are now majority in the university certainly do not incentivize the quality either. An assistant professor like me at the University of Barcelona has a net income of a little over 500€/month (less than 600$/month! ), since it is considered to be a part time job, while permanent staff (with almost the same amount of teaching time) earns 6-12 times more. During early 2000’s Catalonia started a new research program, Icrea, aimed to promote science of excellence and to attract worldwide scientist offering tenured positions in Catalan research centers. At the same time some flagship research centers where created, perhaps the most well known is the Icfo, the Institute of Photonic Sciences. These initiatives, which were initiated in a pre-crisis situation, have been rather successful in terms of publications and catchment of European funding. One is tempted to think that this was a great initiative, but it is debatable how a country (or a region) where “middle-class” science is collapsing can afford to have such “elite programs” to bring renowned international scientists to Catalonia. Few Catalan or Spanish scientists have really benefited from these actions, since most of tenured personnel recruited corresponds to researchers coming from abroad. However, these new research groups have greatly benefited from a continuous source of “cheap workforce” in term of reasonably well educated graduate students coming from Spanish universities and, in many occasions, with Government-funded scholarships. 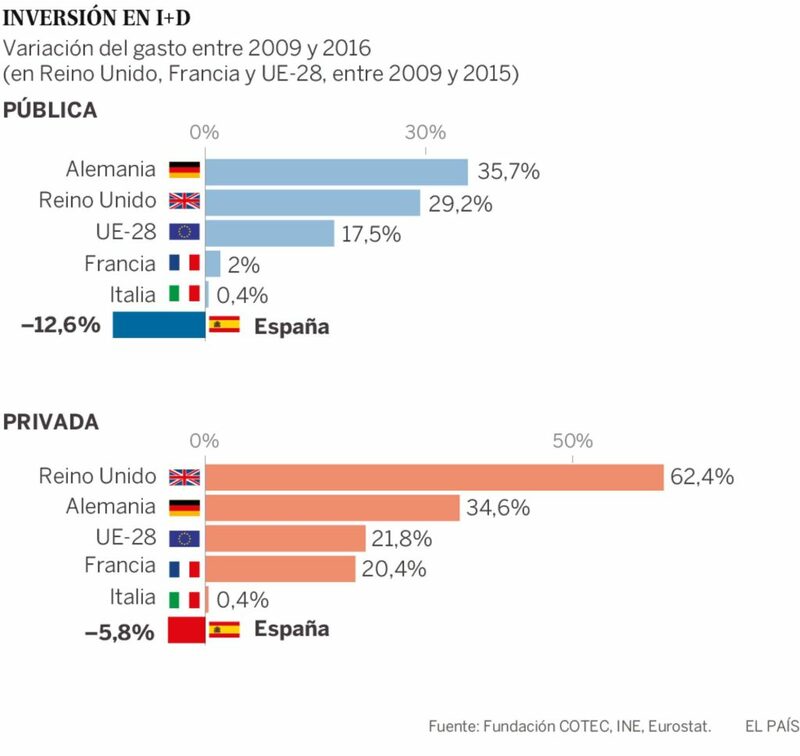 Once they obtain their PhD, almost none of these students will find job opportunities in Spain, so they will emigrate and make their life abroad after Spain/Catalonia has invested thousands of € in their education. This is poor business. I think that this model of “elite research” is only sustainable for Catalonia if it does not leave universities aside, like it is happenning now. It only makes sense to keep this model if the Catalan economy is capable of reabsorb a good portion of the graduates with attractive jobs either in public or private research.